Online sales and Social Media have become an integral part of our lives. Small businesses often fail to take full advantage of the chances they offer. They simply do not have the time to figure out all the intricacies involved in Online Marketing. However, those businesses that do not tap into the new media often see their sales drop, because old-school marketing techniques are increasingly ineffective. Do not believe slick marketeers who claim online marketing is easy and profit is out there waiting for you. Yes, a lot of cool and easy to use services exist to do online marketing. The hard part is determining what you want. Come up with a marketing plan. Only if you develop a comprehensive marketing strategy can you really succeed. Only then you can make a decision as to what tools and services best suit your needs. Today we are happy to announce that the Audience Creator is now live. 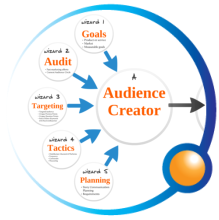 The Audience Creator is the first part of the Content Marketing Wizard. It guides you through the process of developing a Online Communication Plan. So how does that work? When you purchase the Audience Creator, you get access to a variety of templates, samples and tools, as well a complete manual that guides you through the process. On top of that you get story of John, a newbie when it comes to online marketing, and Tim, a marketing wizard. John is guided through all the steps of the Audience Creator by Tim, and in the end you will have his complete and 'real-life' example of how the Audience Creator works. We feel this to be a especially strong point of the Audience Creator: we do not just feed you theory and tell you what to do, we also show you how to do it. Plus it is less boring to read. Everything we do at Content Marketing Wizard we do on the Google Apps platform. All the templates, examples and tools use the Google platform too. This means you are free to work from wherever you want and that collaboration was never easier. A (free) Google account is needed to be able to purchase the Audience Creator. Marketing is not a science. Rather, it is a complex amalgamate of statistics, ideas, trends and psychology. Whole libraries have been written about it. And online marketing is still an emerging trade that changes rapidly. It adds a layer of technology to the marketing process. Trying to break this process down into simple, easy to follow steps was the challenge with which we were faced. Our experiences in online marketing jobs over the years, both on the consultancy and the executive end, have taught us what the common bottlenecks and pitfalls are that companies encounter. We do not claim to have the magic recipe. But we are confident we made a valiant effort. We hope you will agree.